Why choosing the Russian Hair Extensions London? Why not the Indian or Chinese? Indeed, there are plenty of suppliers on the market. They offer an impressive range of processed extensions. Those suit all tastes, colours and lengths. The price for them is much lower than for a Russian Natural Hair. Is a cheap one is as good as the Russian Hair? Not at all. All the cheap hair have been chemically and mechanically processed. Before being sold on the market and this is not only in London. Most of the suppliers collect the raw hair from donors and pack it in bulks. Those bulks are then “improved” to look like natural virgin Remy. Most of this processed hair have been passed through the skimming machine. This process removes the cuticle and makes the hair thinner. It was bleached in strong chemicals and dyed to the desired colour. Is this right or wrong for your Extensions? There is not a simple answer to this question. If the client wants to buy a cheap and knows the hair will serve just a couple of week, why not? The problems come when the customer pay few hundred pounds for extensions. But those get tangled, faded and look awful after just a few shampoos. Here is why the Russian Hair is the best in the world. A professionally fitted set of Russian Hair could last for more than one year with a proper After Care. The maintenance must be done every three or four months. If the extensions are looked after, they will serve several refittings. They will still look gorgeous for longtime. Why is this safe? Because there are no chemicals. No glue. No heat. No damage to the natural hair. Hot or cold fusion methods use the chemical agents. Extensions are glued, and this sometimes can be a disaster for your hair and scalp. The keratin removal can be very damaging and leave severe consequences. Keratin is a chemical and can melt under the Sun, during the styling or when using some shampoo or colouring. If we compare the waving methods, they are all based on the stitching of the wefts or strands. For persons with thin or fragile hair, this can damage the roots. The maintenance is not easy and can result in loss of natural hair. Micro Rings are safe, secure and discrete. They are safe because mechanically fixed to each strand. Each strand receives only a limited portion of extensions. This method is suitable for people with very thin or fragile hair. We often help the people that partially lost it. This can happen after some therapies, treatments or because of genetics. Micro Rings are secure. This is because nothing will lose the fixing of the extensions. Keratin will melt or become messy with hot temperature (holidays in view?). Keratin removal can take hours using the solvents and other chemicals that are damaging. Micro Rings are discrete and almost invisible. Modern Micro Rings are offered in the multitude of colours. Those match any possible hair on the planet. A correctly fitted set will be invisible and be absolutely secure and safe. Yes, we guarantee you will be satisfied! Just read our customer’s testimonials! We offer the larger choice of natural Russian Remy in the UK. Every set of extensions is bespoke colour matched. During your FREE consultation, you will choose the hair you wish to wear. You decide the length and the colour that suit you the best. Prior our fitting appointment, we will individually prepare all the strands. The strands will bespoke match your desired colour. We offer the natural Russian Remy only. We can guarantee your Sublime Extensions can last for than one year. You need an appropriate After Care, ask us for advice. We offer extensions maintenance and re-fitting. During the re-fitting, we will re-fit the new Micro Rings. If necessary will add new strands of natural Russian Hair Extensions London. Call us to book your FREE consultation in London. We will offer you the time that suits you the best. Come and see our vast range of natural Russian Hair in London. We will bespoke match it to your hair. 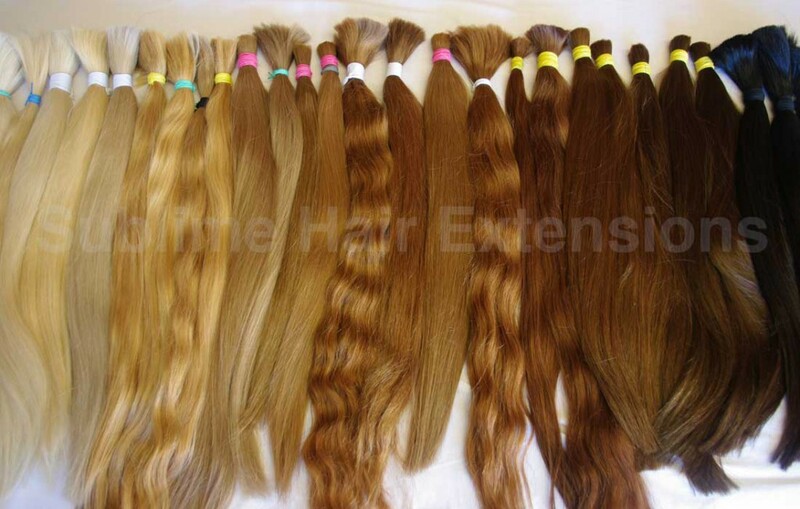 We hand made 100% of our extensions. Come to your fitting in our salon in Notting Hill, London. We use the best method for Hair Extensions London – Micro Rings. They are secure, safe, discrete. You will enjoy your new gorgeous look for months, and the hair will still like new. Come back for regular maintenance every three or four months. We will fit new Micro Rings and add few more strands to get you a gorgeous length and volume. If you follow our Aftercare advice your extensions could last for up to one year!